Discover the rich culture, the untamed frontier, and inspirational sights of the American West. Travel to the legendary Black Hills of South Dakota, an oasis of pine-clad mountains on the Great Plains. Visit the City of Deadwood and discover the legendary life stories of Wild Bill Hickok, Calamity Jane and Wyatt Earp. Travel the magnificent backcountry of Custer State Park and view the diverse native wildlife on the 71,000 parkland acres, including the worlds largest free-roaming bison herds. Visit magnificent Mt. Rushmore, a national treasure, and the Crazy Horse Memorial, home of the worlds largest mountain sculpture in progress. 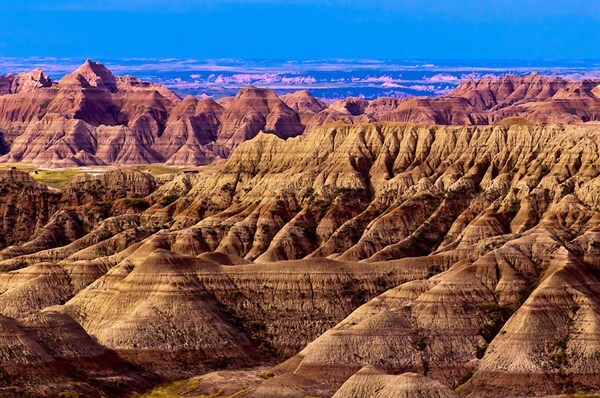 Journey through the natural beauty of Badlands National Park, a geologic wonderland of bizarre colorful spires and pinnacles, massive buttes, deep gorges and one of the worlds richest fossil beds. Weve also included a visit to The House on the Rock, an architectural marvel perched on a 60-foot chimney of rock! Dont miss this tour full of adventure, history and fun! Book Early! 40 Lucky Guests Only! Welcome Aboard! 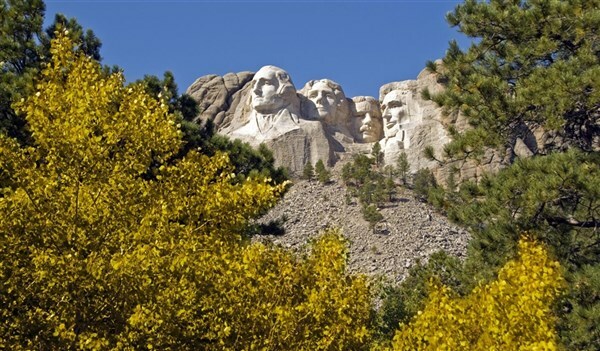 Today we depart on a journey reminiscent of the adventuresome spirit of the pioneering explorers Lewis and Clark, as we travel west to discover the untamed frontier of the "Mount Rushmore State", South Dakota. The major difference is we will travel aboard our deluxe motor coach and stay in comfortable first-class hotels. Before checking into the Hampton Inn in Maumee, Ohio for the night, we are treated to a delicious dinner at a Cracker Barrel restaurant. After a deluxe continental breakfast, we depart for "The Badger State", Wisconsin. After checking into the Hampton Inn & Suites in Wisconsin Dells, Wisconsin for the night, you will have time to unwind and freshen up before we go out for dinner and entertainment. Tonight, we have reserved seats for "Mamma Mia!" at the Palace Dinner Theater. Set on a colorful Greek island, the musical is based on ABBA's 1975 chart-topping song "Mamma Mia!" and the story serves as a background for a wealth of other ABBA songs. "Mamma Mia!" is the tale of a mother, a daughter who is about the be married and discovers that any one of three men could be her father, and a trip down the aisle that you will never forget! Everyone has fallen in love with the music, the story and characters that make "Mamma Mia!" an ultimate feel-good musical. "Mamma Mia!" will leave you singing and dancing in the aisles! Following the show, we return to our hotel for a good night's sleep. 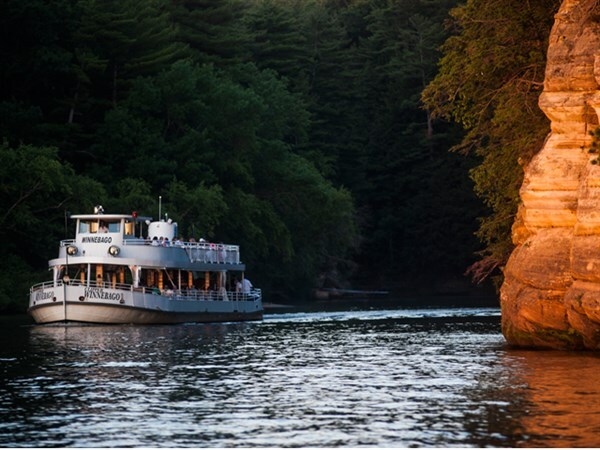 After a buffet breakfast, we will embark on a delightful 2-hour boat cruise through the beautiful Upper Wisconsin Dells where you will marvel at the high cliffs and dramatic geological formations. We will navigate through the treacherous Devil's Elbow, and make two exclusive and unforgettable shore landings where you can go ashore to explore mysterious Witches Gulch and see the famous dog leap at Stand Rock. Following our boat cruise, we depart for Sioux Falls, South Dakota, with our included box lunch. After checking into the Country Inn & Suites for the night, relax and enjoy a leisurely dinner on your own at the Falls Landing Restaurant, adjacent to our hotel. After a deluxe continental breakfast, we depart for Mitchell, South Dakota and The Corn Palace. The rich history of this region dates back one thousand years beginning with a tribe of semi-nomadic hunter farmers who first harvested corn in this area. The story continues with the Homestead Act of 1862 and westward expansion of the railroad, and how these events led to the construction of this unique building. Later we depart for the Keelboat Visitor Center to climb on board the 55-foot Keelboat that the Corps of Discovery traveled on as they explored the Missouri River. Don't worry it does not go on the river, just experience breathtaking views from the stern of the keelboat. "Re-live" Lewis and Clark's journey with interpretive panels that explain the Corps adventures traveling through present day South Dakota. Next, we depart for the Town of Wall, home of the famous Wall Drug Store. The drug store first opened as a small pharmacy during the depression and eventually developed into a large roadside tourist attraction. A delicious lunch is included at the Wall Drug Café. After our visit, we depart for Deadwood, South Dakota for a four night stay at the Deadwood Gulch Gaming Resort, nestled in the beautiful Black Hills at the edge of town. Deadwood Gulch Gaming Resort also houses a 24-hour casino with player's club benefits, free well drinks, tap beer and wine while gaming, a bakery, liquor store, exercise room, patio seating, full service bar, free Wi-Fi and best of all free $5.00 match play per day. Bring your bathing suit to take advantage of the large hot tub. A refrigerator and microwave are provided in your hotel room. Tonight, dinner is on your own. After breakfast, we depart for an exciting day of sightseeing in the Black Hills. Don't forget your camera! Our first stop is at Bear Country U.S.A., the home of the largest collection of privately owned black bears in the world. Guests are guaranteed to see more than they bargained for from the comfort of our deluxe motor coach, as visitors watch as these clowns of nature frolic in a pool, climb trees and amble across the road in front of our motor coach. In Babyland, you will see black bear cubs and young wolf pups romp through their grassy enclosures. Mt. Rushmore National Memorial our next stop is known in the Black Hills as the Shrine of Democracy, featuring the huge carved faces of Presidents Washington, Jefferson, Lincoln, and Theodore Roosevelt looking down from Mt. Rushmore. You will also have the opportunity to visit the studio of Gutzon Borglum, the monuments sculptor, and the gift shop. Later we return to our hotel to relax and freshen up before going out for a fun evening at the Circle B Ranch Chuckwagon Supper & Show. Note: One evening we will return to see Mt. Rushmore at night illuminated by bright lights. After breakfast, we depart for a tour of Custer State Park. Few truly wild places remain in this country, yet Custer State Park is one of them! The park is home to a variety of wildlife and magnificent scenery spanning 71,000 acres. Nearly 1,500 bison, commonly called buffalo, roam the prairies and hills of Custer State Park, which they share with swift pronghorn, shy elk, sure-footed mountain goats and curious burros. Following our tour, we will enjoy a delicious lunch before returning to our hotel where you can choose to relax, play at the casino or shop in town. Later this evening we depart for Crazy Horse Memorial, home of the world's largest mountain sculpture in progress. The Memorial's visitor complex includes the 40,000-square foot Welcome Center and theatres, the Indian Museum of North America, the Native American Educational & Cultural Center, the sculptor's log home studio and workshop, indoor and outdoor galleries, museum gift shop, restaurant and snack bar areas and expansive viewing veranda. We conclude our day with dinner at the Crazy Horse Memorial, followed by a laser light show before returning to our hotel. After breakfast, we will board a tour bus, owned by movie star Kevin Costner, for a tour of Deadwood, including Mount Moriah Cemetery where Wild Bill Hickok and Calamity Jane is buried. After our tour, you will have some free time to explore the town and dinner is on your own. After breakfast, we say goodbye to our host city and depart for Badlands National Park, South Dakota to tour The Badlands National Park. The Lakota gave this land its name, "mako sica", meaning "land bad". This land of sharp ridges, steep walled canyons, gullies, pyramids and knobs has been so ruthlessly ravaged by wind and water that it has become picturesque. The Badlands are a wonderland of bizarre colorful spires and pinnacles, massive buttes and deep gorges. Erosion of the Badlands reveals sedimentary layers of different colors, purple and yellow (shale), tan and gray (sand and gravel), red and orange (iron oxides) and white (volcanic ash). After our tour, we depart for our overnight stay at the Country Inn & Suites in Sioux Falls, South Dakota. Tonight, dinner is on your own at the Falls Landing Restaurant, adjacent to our hotel. After a deluxe continental breakfast, settle back, relax and enjoy the scenery on our drive across Minnesota and cross the upper Mississippi River into Wisconsin, "The Badger State". Later we arrive in the small town of Dodgeville, Wisconsin, and check-in to The House on the Rock Inn, our overnight accommodations. We are treated to a delicious dinner served at the Country Kitchen. After breakfast, it's a short ride to Spring Green, Wisconsin and The House on the Rock. 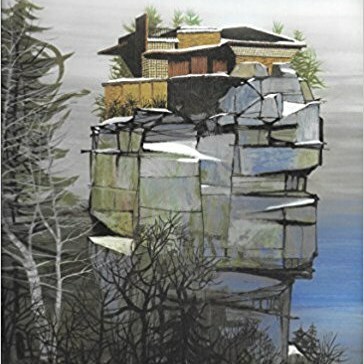 Designed and built by Alex Jordan of Madison, Wisconsin, the house is an architectural marvel perched on a 60-foot chimney of rock. Begun in the early 1940's, it overlooks the breathtaking panorama of Wyoming Valley. The 14-room House, sculpted atop Deer Shelter Rock, is the original structure of what is now an extraordinary complex of rooms, streets, buildings and gardens covering over 200 acres. On your self-guided tour, you will explore some of the world's most unique collections including the world's largest carousel, a 200' sea creature, automated music machines, and much more! Following our tour, we continue our journey eastward, passing through the Chicago area and skirt the southern shore of Lake Michigan on our way to our overnight stay at the Hampton Inn in Maumee, Ohio. Tonight, we are treated to a delicious farewell dinner at a local restaurant. After a deluxe continental breakfast, we depart for home having enjoyed the fellowship of friends old and new on our 2019 The Black Hills of South Dakota tour. Having had a wonderful sense of adventure and of exploration on our journey through the western frontier, we return home with many marvelous memories, pictures and souvenirs! 1. All money will be gladly refunded in full when cancellation is made 45 days prior to departure (which is the same as the balance due date). Any cancellation made after the 45 days will result in forfeiture of any amounts paid by the customer (no option of transferring the money paid onto another tour). 2. A $2.00 service charge for any cancellations unless you transfer to another tour. 3. We will make every effort to sell your seat, providing we have a wait list. 4. Gunther Tours strongly suggests trip cancellation insurance. You can obtain an insurance brochure by calling the office; however, you will need to contact the insurance company directly for rates and information.